You Bet Your Tulips Those Spring Bulbs Will Come Back! | Gardens Alive! You Bet Your Tulips Those Spring Bulbs Will Come Back! "…Every year, we plant tulip bulbs in a five foot oval, 18-24 inch deep patch of earth on our flagstone patio. Having been to Holland and seen how the Dutch do it, we jam about 200 bulbs into this patch to get that 'wow' factor. (We also spread stone shards around the buried bulbs as a squirrel deterrent—advice you gave us about 10 years ago when squirrels stole the 500 bulbs we brought back from Holland!) The spring display is magnificent. But around mid to late May we of course lose the flowers, and then put in impatiens or other colorful plantings. The tulips never return the following year, and so we buy new bulbs every Fall. I'm wondering if there is an alternative to this costly process. My wife insists we can't leave the bulbs in the ground over summer and plant anything else above them, as it will ruin the bulbs. So first, is she correct? And second, if she is, can we somehow store the tulip bulbs (in a cool dry place or buried elsewhere?) so we don't need to buy new ones each year? Thanks,"
The reason she's right is in the DNA and geographic origins of the bulbs. It's easy to think of tulips as being native to Holland, since that nation has done so much to breed and market them—and if they were, they'd love being underneath plants that are watered all summer, as many bulb fields in Holland are technically below sea level. But tulips are instead native to some of the most God-forsaken terrain on the planet—mountainous areas in Russia, Afghanistan and Turkey that are snow covered all winter and blisteringly hot and dry all summer. That's why the Dutch harvest their crops of bulbs right after the flowers bloom and the leaves change color; they'd rot if left in that wet soil after that. 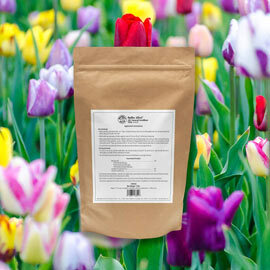 Bottom line: Spring bulbs return most reliably when they have a dry dormant period over Summer. But first, you have to recharge those bulbs. 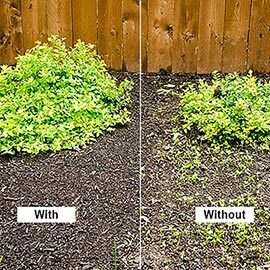 This growth of the following year's flowers is also why you absolutely MUST allow the green leaves to lose their green color naturally. Those leaves are collecting the solar energy the underground bulb needs to produce those flowers. If you cut off the leaves before they can collect that energy, no future flowers. When the green color has faded to tan, carefully dig the bulbs up. You can clip off the leaf remnants or leave them be. If the soil was damp or wet, let the bulbs air dry for a few days (indoors, unless you want to give Evil Squirrels and other vermin a treat). Underneath a gently turning ceiling fan is ideal. (No direct sun!) Then store them in a cool dry place until it's time to replant them in the Fall. How best to store them? I've had success packing them in peat moss, soil free mix, perlite, even dry and crumbly garden soil; in buckets, galvanized tubs and big plastic pots. Put a layer of dirt or peat or mix or whatever in the bottom of the container, then a layer of bulbs, then more 'dirt', more bulbs, etc. until you're done; then add several inches of your 'packing dirt' on the very top. I've been doing this very thing ever since British garden writer Anna Pavord suggested it on our show while promoting her classic 1999 book "The Tulip". Like much of the rest of the world, I need to use my main bulb bed for other things over the summer, and was rotting the underground bulbs by watering the impatiens and marigolds that followed them. Now I dig and store—and have tulips that are teenagers!